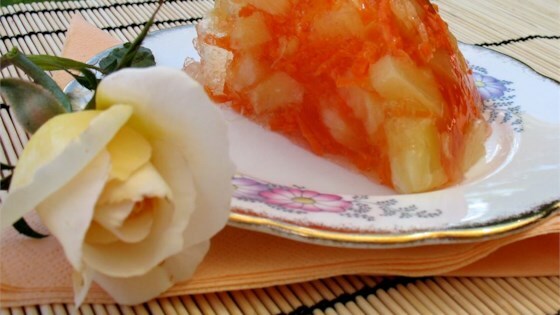 "Old-fashioned carrot salad made with lemon Jell-O and pineapple. Grandma didn't specify the amount of carrots. You probably can't use too much!" In a large bowl, prepare the lemon gelatin according to package directions using reserved pineapple juice in place of some of the water. Refrigerate until thickened, about 1 hour. When the gelatin has thickened, stir in pineapple and shredded carrot. Cover and refrigerate until set, at least 4 hours. My carrots turned somewhat brown. Taste and texture were awful. Not to my liking. Sorry. Great recipe. Super easy. My Grandma always uses orange jello. This is always a holiday favorite as the bright color pairs well with other foods. great salad!!! however I do like better when made with lime jello. Oh yes, I remember mom making this salad back in the day. She called it Complexion Salad - said that it was great for your skin!